It’s Walmart’s annual shareholders week, and with multiple events planned for associates, media and investors, there’s plenty worth following. Keep up with it here – we’ll be posting updates throughout each day. We’ll also share announcements on Twitter @WalmartNewsroom. 12:00 PM: It’s a wrap! Family reunions are not uncommon in the summertime – but family reunions of 14,000 people? That’s something special. Today’s Associate Meeting was a culmination of a week filled with learning, inspiration and friendship. Plus… Jamie Foxx! The last time Jamie hosted was 2009, and so much growth and change has occurred since that time. As Greg Penner, Chairman of Walmart’s Board of Directors, said, "Walmart is transforming – and not by making some false choice between being a store-only retailer or an eCommerce-only retailer. We see the world differently. We see it through our customers' eyes. Walmart is a growth company with the customer at the center of everything we do." His sentiments were echoed by Brett Biggs. After a performance by Voice winner Cassadee Pope, the crowd heard from Marc Lore, who covered Walmart’s advancements in seamless shopping. Stepping out afterward in a striking yellow pantsuit, Carly Rae Jepsen performed her hits "I Really Like You" and "Call Me Maybe." Next on stage: Sam’s Club leaders John Furner and Gisel Ruiz. They referenced Sam’s Club’s Q1 momentum and spoke about the opportunities Walmart offers associates. They were followed by the Walton family, who presented the Sam M. Walton award to Lupita Morales, Vice President of our Superama stores in Mexico. Jamie Foxx honored Lupita with an on-stage karaoke dance party. Greg Foran shared how Walmart is leading the way with innovation, and promoted Tanaka Chikerema, an associate from Texas, on the spot. Jacqui Canney, executive vice president of Walmart’s Global People division, noted the important work Walmart is doing creating shared value for communities. Her sentiment was echoed by Ellen DeGeneres in a video message to associates. Newly-appointed International CEO Judith McKenna noted Walmart’s recent acquisition of eCommerce chain Flipkart and recognized associates for their contributions to the company’s success around the world. After a performance by X Ambassadors, the real star of the show came out – Mason Ramsey, the Walmart Yodel Boy! He introduced Doug McMillon, who emphasized our culture and commitment to shared value, as he recalled how associates delivered for customers and communities after last year’s devastating hurricanes. Doug offered a look back at Walmart’s past and how the company is preparing for the future, innovating and creating new opportunities for associates. "The world is a better place with Walmart in it. The next generation needs this company," McMillon said. The meeting wrapped with a performance by singer Jason Derulo. For more on today’s meeting, check out our photo gallery. Thanks for following our live blog this week – see you next year! Walmart associates from around the world are filling up Bud Walton Arena in Fayetteville, Arkansas. You can join the excitement, too - just tune in to our live stream. This year’s Associate Meeting starts at 8 a.m. CDT, but we’ll be kicking it off early with a preshow starting at 7:40 a.m.
Years ago, the basics mattered most when it came to running a great store: having really good items, and having those items in stock. Those things haven’t changed, said Greg Foran, President and CEO of Walmart U.S., but now there’s an exciting new layer: the opportunity that technology and eCommerce have presented to interact with the customer. "I think the customer is demonstrating to us how ambidextrous they really are," Foran said as he recalled a customer shopping in the toy section and pulling out her Walmart app to check a price. "They see it all as one Walmart." Today, Walmart stores connect to Walmart.com in all sorts of ways. Marc Lore, President and CEO of Walmart eCommerce U.S., said services like online grocery that combine the strength of Walmart’s physical footprint with the convenience of the internet are key to future success. With more than 5,000 Walmart stores and clubs in the U.S., and 90% of Americans living within 10 miles of a Walmart store, those locations are essentially distribution centers that are already profitable. "In 5 to 7 years, a converged retail experience is the sweet spot for us all," Foran said, "so we better be reasonably nimble but not lose sight of principles." What does the future of shopping in a store look like? Easier. More efficient. And in many Walmart locations across the country, the future is happening now. For customers, it’s about saving time in any way possible, and smartphones help. Recent updates to the Walmart app have introduced tools that improve everything from returning an item to refilling a prescription. Store Assistant, a feature introduced earlier this year, helps customers find items quickly, and makes list-building more convenient than ever. · FAST unloader – an innovation that automatically scans and sorts items based on priority and department. · Downstock app – Information from the Bossa Nova scanner flows to this app, which shows associates what items are out of stock and where to get them in the store, significantly reducing the time it takes to identify and resolve issues. John Crecelius, Vice President of Central Operations for Walmart U.S., encouraged media to think of it all as a “connected store,” meaning different connected technologies that enable faster, smarter work – and shopping. “All of this comes together to improve our accuracy and availability for our customers, and to improve the jobs of our associates,” Crecelius said. Jetblack, a new shopping service that combines the convenience of eCommerce with the customized attention of a personal assistant, launches in limited release to customers in Manhattan and part of Brooklyn today. Led by Rent the Runway’s visionary Jenny Fleiss, Jetblack offers its members the ability to text nearly any shopping request and Jetblack will find the right products and deliver them the same or next day for no additional charge. The service is the first to launch from Walmart’s technology incubator, Store No 8, where it previously operated in stealth as "Code Eight." Through its curated shopping recommendations sent via text and voice-to-text (aka "conversational commerce"), Jetblack can deliver time-strapped urban parents everything from birthday gifts to household essentials. The service uses a combination of artificial intelligence practices and expertise from professional buyers across the home, health, parenting, fashion and wellness categories, as well as parents themselves. Some everyday essentials may be sourced from Walmart and Jet.com, while other items and specialty products are procured from local brands and shops. Examples have included sourcing a specific beauty cream from a member’s favorite local boutique, curating custom Easter baskets and delivering them once the kids are asleep and rushing beach essentials to a family on vacation. Jetblack launched its closed beta in Manhattan early this year and members say shopping with Jetblack is as easy as texting a close friend who knows your preferences. For more on Jetblack, check out the launch announcement. In October, Sam’s Club launched a new strategy that focuses on simplification. Today, CEO John Furner shared with reporters that over time, what was once a simple business had become too complicated. So the team got very specific about their target member and began making changes to become more special to them. For example, they’ve added more value to a Plus membership, like free shipping on most items. "We are all aligned on a core focus and it’s the reason we are seeing such positive results," Furner said. Last quarter’s results reflect the positive momentum, which is driven by a fun, curated assortment that’s priced right. The goal for the rest of the year is simple, Furner added – Sam’s Club will focus on what members love: great items at disruptive prices. Customers never hold back telling us the brands and products they’d like to see in our stores and online. We’ve been listening. Chief Merchant Steve Bratspies and eCommerce Chief Revenue Officer Scott Hilton shared some of these findings as merchants prepared a parade of products for assembled media. In addition to a focus on providing quality, innovation and exclusivity in categories like apparel and electronics, Bratspies and Hilton spent some time unpacking recent changes to the merchandising experience on Walmart.com as part of the site’s recent redesign. "Walmart customers can find everything they need and want at Walmart accessible in a way that suits them," Bratspies said. "Being merchant-minded is at the core of Walmart; finding and putting great products on the shelves is part of who we are." 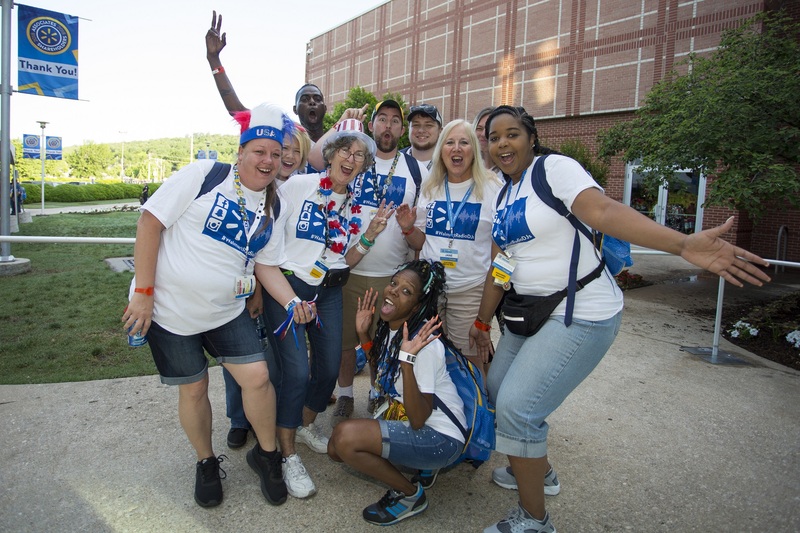 More than 1,000 associates, 26 countries, 500,000 airline miles and lots of enthusiasm: These are just a few of the things that set the mood for Walmart International associates who gathered at Barnhill Arena on the University of Arkansas campus for the International Associates Meeting. "We put together Associates Week as a way to appreciate our associates – we’re teammates and have a purpose to help people save money and live better", said Doug McMillon, President and CEO of Walmart, who opened the meeting. "You have earned the opportunity to be here, and this week at Shareholders is all about you," McKenna said. “Your passion for our culture and for our company will grow. You’ll feel like you’re part of something even bigger and more special than you ever imagined. You're going to see we’re all more alike than we are different. Because we all share a common thread – something that binds us together. It’s our pride, purpose and a deep caring for the people around us that connects us all." Shareholder voting results for Walmart Inc. (NYSE: WMT) are now available. Read the press release here to see results of formal business and proxy proposals. A replay of the meeting’s webcast is available here. The future economy depends on access to post-secondary education. Such was the consensus among education experts who joined a panel to discuss the potential impact of Walmart’s announcement that it will cover the cost of tuition, books and fees for full- and part-time associates seeking to complete a college degree. According to the World Economic Forum, 65% of students entering primary school this year will ultimately enter a job that doesn’t exist today. The stakes couldn’t be higher. "Most college students today actually juggle work or parenting or both in addition to education — almost half are on their own financially," said Danette Howard, SVP and Chief Strategy Officer at the Lumina Foundation, the nation’s largest foundation focused solely on increasing student access and success in post-secondary education. "At the same time, research shows that up to a third of people will need to develop new skills by 2030 to remain competitive. Walmart is taking away the affordability obstacle. Competency is currency." For Rachel Carlson, CEO of Guild Education, the Denver-based startup Walmart partnered with to offer the new degree program, providing access to skills training and post-secondary education not only impacts the long-term prospects for workers, it drives positive business outcomes as well. "We’ve seen with companies offering a program like this that 15-to-20 percent of new job applicants indicate it was the reason they applied for the job," she said. "And for folks already with the company, participating in a program like this has a 2.4x impact on promotion rates. It’s a win-win-win for companies, universities and, of course, students." For more on Walmart’s new education benefit, see the announcement press kit. Julie Murphy, EVP of Walmart U.S. People, just announced a new program with Guild Education that will cover the cost of tuition, books and fees for full-time, part-time and salaried associates heading back to college. At just $1 per day, the program offers a clear path to a debt-free college degree. Associates participating in the program will be able to earn an associate's or bachelor's degree in Supply Chain Management or bachelor's degree in Business. Degrees will be offered from the University of Florida, Brandman University and Bellevue University. We're making college affordable. Students will not need to pay any upfront costs, eliminating the need for any student loan debt and addressing one of the biggest hurdles that keep people from returning to college. Additionally, associates who complete Walmart Academy training will be able to earn college credits that can be applied at the three universities toward their respective degrees. As of today, thousands of associates have collectively earned more than $210 million in college credits through their participation in Walmart Academy. To learn more about Walmart’s new, comprehensive education benefit, including additional open-access opportunities, check out the announcement press kit. The My Walmart Schedule app helps provide associates with more predictability and flexibility to manage family life - and work life. Using the app, associates have new options for picking up additional hours to help create a schedule that works for them. They can also access the most up-to-date information, pick up unfilled shifts and have visibility to all approved time off requests. Also, now being piloted in just over 100 stores, associates can even swap and exchange shifts with their co-workers. “If an unexpected thing comes up in your life, you can make sure your shift is covered," said Mark Ibbotson, EVP of Central Operations for Walmart U.S., who shared the news with associates. The app is now in more than half of our stores and will be available for all associates before the holidays. We’ve been using virtual reality to train associates as part of our Walmart Academy program for over a year. Now, we’re going even bigger, testing VR to teach and train associates in their stores. The first application is training associates how to set up and use their new Pickup Tower. The Oculus headsets help associates learn more quickly, retain information better and become more engaged and excited. Already in the test, associates are showing enthusiasm for the new tech. And the coolest part is, as new training modules become available, we can push updates directly to the headsets. A future with no instruction manuals — it’s within reach! “We want our people to learn…and have fun doing it," said Mark Ibbotson, EVP of Central Operations, Walmart U.S. “Retailing is an exciting business and, in VR, you can really feel it." 9:10 AM: What if training were as easy as playing a game? Smartphone apps have made life easier in so many ways. At work, Walmart U.S. associates have several apps to help make their jobs easier, too. Today, Mark Ibbotson, EVP of Central Operations for Walmart U.S., announced a brand-new one that we’re testing that takes associates through an online simulation of customer service tasks. The simulation will be used to train associates on new process and special in-store events that can’t be easily recreated, much like VR is used in our Walmart Academies. It will first be introduced for associates going through our Academy program and will eventually be publicly available. “You can see how the game is a more interactive and fun way to learn," Ibbotson said as he walked associates through a reenactment of game play. He finished by asking associates to help name the game - they’ll be able to submit their ideas starting soon through the company intranet, the WIRE. Personal style is the ultimate expression of self. And who doesn’t love comfort and flexibility in what they wear, especially at work every day? Today, Todd Harbaugh, Executive Vice President of Walmart Neighborhood Markets U.S., announced that our 1.5 million Walmart U.S. associates will be getting even more of these things soon, as we’re updating our in-store dress guidelines. “How would you like to start wearing blue jeans to work?" Harbaugh asked the crowd. Among the roar of cheers that followed, he answered, “Well guess what, starting next week, you can!" So what else is new in the updated guidelines? · Nearly any short- or long-sleeved shirt is allowed. · Management associates can now join hourly associates in being able to wear tennis shoes. · We’re removing most restrictions on hairstyles, tattoos and piercings. · The iconic Walmart vest and name badge will still be part of associates’ ensembles. “We want you to wear what makes you feel good. And we want you to be yourself at Walmart," Harbaugh said. Read more from Karisa Sprague in this blog post. Associates representing stores, distribution centers and facilities across the U.S. are filing into Bud Walton Arena in Fayetteville for the first major event of the week — the Walmart U.S. Meeting. The U.S. meeting offers an opportunity for field associates to hear directly from segment leaders in Walmart Neighborhood Market, Supercenter, eCommerce and Supply Chain. This morning, expect to hear a number of updates to benefits and store policy, many of which come as a result of store visits and “listening tours” conducted by Walmart leadership each year. Sam Walton began the tradition of weekend store visits in the 1970s, when he would fly himself (yes, Walton was a pilot too!) to community after community, meeting with associates and customers to gather their ideas about how to improve the experience of shopping and working at Walmart. 4:00 PM: Welcome, Walmart associates! Our 48th annual shareholders business meeting officially happens tomorrow, May 30, but the excitement kicked off this past weekend as associates from around the world began arriving in Northwest Arkansas. It’s our largest global gathering every year, with more than 6,000 associates traveling from 30 countries (and speaking six different languages! ).